Big Walnut High School members of the National Art Honors Society work on feline versions of the Mona Lisa and Scream paintings in the Tranquility Room of the Humane Society of Delaware County. The Humane Society of Delaware County is at 4920 St. Rt. 37 E. Visit hsdcohio.org or call 740-369-PETS (7387). 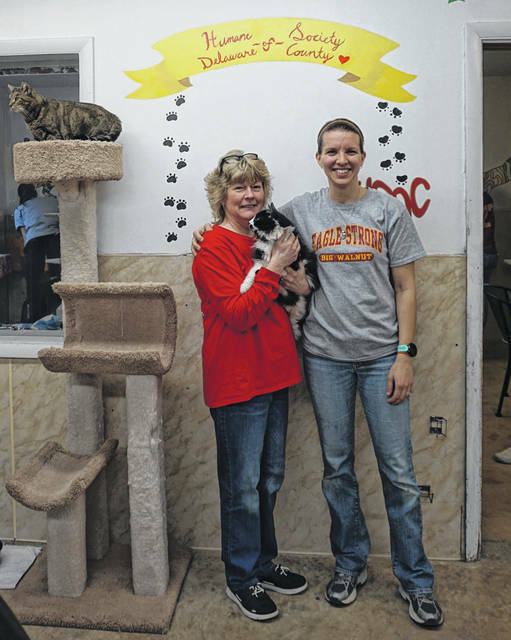 The Humane Society of Delaware County’s adult feline section is now the cat’s meow, thanks to the Big Walnut High School’s National Art Honors Society. For three days in mid-February, the art students painted a couple of rooms at the facility, filling the walls with pet-themed artwork. There’s realistic silhouettes of cats at play; a colorful wall pattern of cats staring; and the tranquility room for shy cats is now adorned like a museum with feline art masterpieces, such as imitations of the Meow-na Lisa, and a Pablo Pi-cat-so. There’s even an area where families can pose with their newly-adopted pet for a photo. All the walls were first given a white base coat, design ideas were placed, and then painted over. The students worked with the cats in the rooms, and although there may have been more foot traffic than they were used to, the cats adapted easily to the bustle. Cassidy said the HSDC doesn’t receive government funding and relies on donations and grants, so the spring project was most welcome. Carrie Kaelin, a volunteer and board member, said this was a good time to do the painting since there were only about 20 cats waiting to be adopted at the time. That number is likely to increase by the end of June, she said. Art teacher Melissa Maxson is the founder of Big Walnut’s NAHS, now in its 10th year. In years past, high schoolers interested in art did service projects such as painting games on the blacktop of Harrison Street Elementary.